What shall we do in case of damage? Latest! Hunicorn always among the bests! We were selected as Top three agent in Europe in 2013, according to WCA independent top list! Hunicorn International Freight Forwarding Limited contracts with rail, trucking, and shipping companies on behalf of its clients. 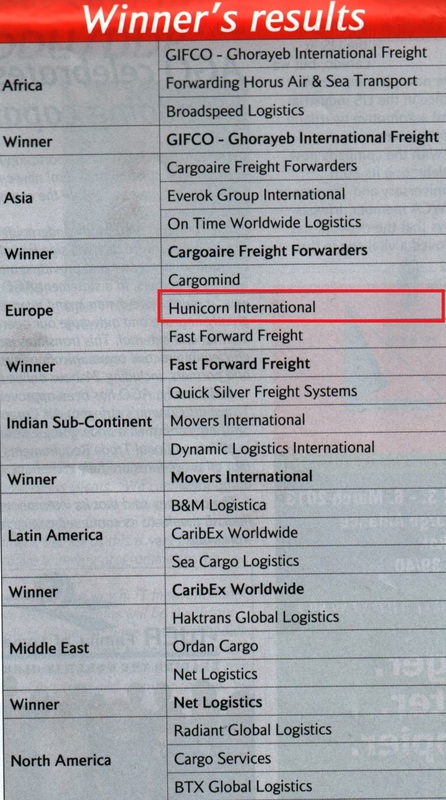 Our main profile is overseas transportation and we have worldwide relationships, as Hunicorn Ltd is a member of two international shipping networks. We arrange both our FCL and LCL sailings via Hamburg, Bremerhaven, Koper and Trieste ports. We have weekly export and import groupage services to and from Hamburg and we are one of the few Hungarian forwarding companies, to have their own direct consol services from Chinese and other Asian ports to Budapest without transhipment in Hamburg. In addition, we can arrange air shipments, customs clearances, warehousing and cargo insurance. In 2007, we shipped approximately 2000 containers and 6000 cbm LCL goods, delivered more thousand kgs of air shipments around the world, and our revenues exceeded 4,5 million USD. Currently we have 11 employees, and are able to provide services in English, German, French, Italian and Chinese. Our company adopted quality control system in 1997. We use the ISO 9001 standard audit. Our company is a member of the Association of Hungarian Forwarding and Logistic Service Providers, and we are working under the Hungarian General Forwarding Conditions. Administration utilizes an up-to-date forwarding program. Our goals are to extend our business to surrounding countries and strengthen our Middle-European market.